The Merchant of Venice is an intriguing drama of love, greed and revenge. At its heart, the play contrasts the characters of the maddened and vengeful Shylock, a Venetian moneylender, with the gracious, level-headed Portia, a wealthy young woman besieged by suitors. 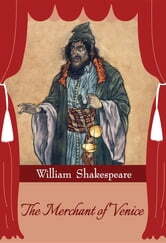 At the play's climax, Shylock insists that a binding contract be enforced which will cost the life of the merchant Antonio. Pleading Antonio's case before the Duke of Venice, Portia shrewdly defeats Shylock's evil purpose.